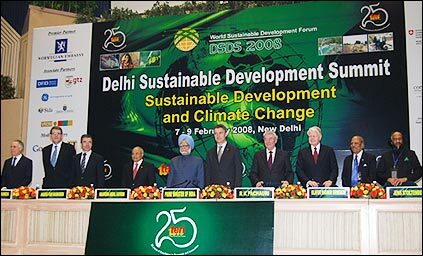 The inaugural session of DSDS 2008 was held at Vigyan Bhavan on 7 February 2008. The eighth DSDS is being held in the background of the increasing concerns related to climate change in the world today, which have been articulated in the Fourth Assessment Report of the IPCC. The summit assumes greater significance as it connects issues related to sustainable development with climate change, and hopes to encourage activities that need to be undertaken for sustainable development across the globe. The debate on climate change gained further momentum after the 13th COP (conference of parties) held at Bali in December 2007, and the DSDS 2008 is expected to take forward the discussions on both the challenges and the opportunities facing the world today. The impacts of climate change are global and unequivocal, but ironically are felt most by the poorer sections of society who have contributed least in polluting the environment. The measures adopted for combating climate change would also translate into action against poverty, and organizations like TERI have a responsibility to create a climate for this change. India needs to take the lead and be a frontrunner in taking steps to tackle climate change. The Prime Minister’s Council on Climate Change is currently working on a national programme to address various relevant issues. However, the recommendations of this plan would require commitments of time and resources from all sections of society including governments, businesses, and the civil society. In this context, India’s Eleventh Five-year Plan (2007–12) articulates strategies in the areas of afforestation, sustainable energy use, flood protection, transportation and financial instruments such as capital debenture funds. Developing countries need to find a middle path between development and addressing the sustainability challenges with the forward-looking policy interventions. For example, the subsidies on products like kerosene could be shifted to environmentally benign technologies such as solar devices. 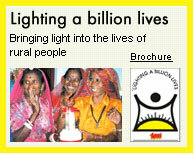 TERI’s Lighting a Billion Lives campaign aims to promote the use of solar devices through the dissemination of solar torches and solar lanterns to households in villages without electricity.